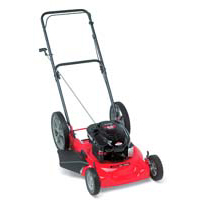 The Brush Cutter is designed for heavy-duty brush clearing with an extra-large motor and an aggressive cutting blade. Some models appear to have something kin to a motorcycle engine for power, a 2″ to 3″ shaft, an almost frightening 10″ to 12″ cutting blade and a harness to strap it on. If you want to “terminate” acres of scrub brush and up-to 4″ diameter trees, this may be your tool. Before buying, make sure the balance and fit is comfortable to you.